When: Saturday June 26, 2010. This cute look from Kyla gave me the idea of pairing this pink dress with this white collar shirt! I really like how it makes the entire look more fresh and fun! 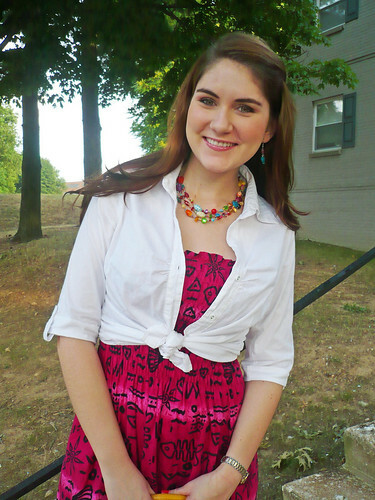 Plus, I got to wear some bright colors with the necklace and the pop of yellow from the purse! Do you ever wear collar shirts over dresses? What a funky pink dress. I really like your necklace especially. I love the dress. and i think this way is the best way of wearing it. i got you an award in my blog. come and take it please? thanks! I just wore a collar shirt over a dress yesterday! A good summer jacket option. I haven't tried knotting mine in front ... I love your necklace! It is really lovely! Cute dress! I'll have to try the collar shirt over a dress look sometime. I like that necklace too! You look so fresh! Love that dress!!! Cute, and well put together, as always! Love the dress! Very cute! The bright pink and yellow looks fabulous. You did a great job! Cute look! I've never paired a button down over a dress, perhaps I'll try it out!